Weak link • Mineral more likely to flow under pressure. Geophysical measurements collected in the western United States reveal correlations between high concentrations of quartz and high temperatures deep in the Earth's crust. USU geophysicist Tony Lowry says quartz is key to rock cycles resulting in large-scale deformation of continents. Image courtesy Tony Lowry, Utah State University. 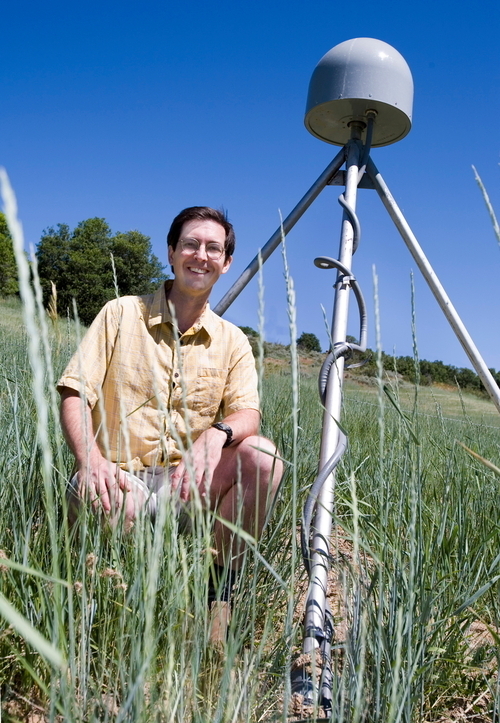 USU geophysicist professor Tony Lowry next to a GPS receiver, installed in Wellsville Canyon as part of EarthScope, a federally funded array of geophysical instruments. Photo by Donna Barry, Utah State University. Plate tectonics revolutionized geology more than 40 years ago, yet a nagging question has remained. John Tuzo Wilson's theory explained how continental plates ride on Earth's crust like a moving jigsaw puzzle, but did little to explain why and how continents pull apart and deform. Mountains rise and faults open over the continents' interior fissures again and again through geological time. "This is one of the big questions in geoscience. We haven't had a good reason for why this would be the case," said Utah State University geophysicist Tony Lowry, whose new study may shed some light on this mystery 20 miles beneath Earth's surface. One of Earth's weakest and most common minerals, quartz exists in greater abundance deep under mountains, he has concluded by analyzing data from EarthScope, a massive grid of seismometers and other geophysical instruments installed across the western United States. The study, co-authored by University of London's Marta Perez-Gussinye, was published March 17 in Nature, among the world's most prestigious science journals. The measurements the team crunched were the speeds of seismic pressure waves and the slower, but more potent shear waves (known as P and S waves), as well as crustal depths. 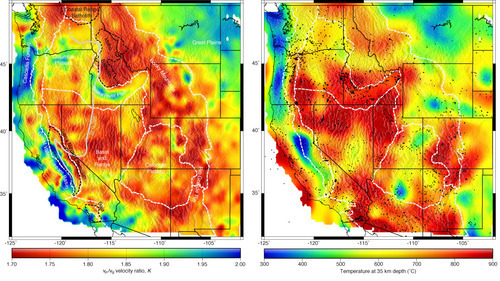 The team mapped the ratios between velocities of P and S waves across the West. Low values in these ratios point to high concentrations of quartz in areas of crustal weakness, according to a commentary by Berkeley geophysicists Roland Burgmann and Pascal Audet published with the study. Because by themselves seismic velocities cannot reveal much about composition, Lowry's innovation was to use velocity ratios to characterize the crust miles below the surface. "The key aspect is a new way of using EarthScope data to map out differences in composition, specifically quartz. That in and of itself is very interesting," Burgmann said. Quartz flows much more readily than other rocks at high temperature and pressure at great depth, so it makes perfect sense that the silica-based crystalline mineral would be associated with buckled crust. "Once a deformation zone has been initiated, further weakening by increasing temperatures and addition of fluids may sustain a permanently weak zone over many plate tectonic cycles," the Berkeley scientists wrote. An example of such a zone runs along the eastern edge of Salt Lake City. "The Wasatch is a tectonic boundary now, but it was also a boundary 800 million years ago," Lowry said. "The thing that blew my mind was that the things [known to] make rock weak aren't going to hang around for 800 million years." Since his graduate studies at the University of Utah, Lowry has long figured that crustal composition, as well as temperature and water, must have something to do with this phenomenon. "It was something I thought about for a long time, but I didn't have any proof," he said. Armed with National Science Foundation funding, he had set out to study flow strengths when he dug into the EarthScope data and began seeing intriguing patterns that suggest composition indeed plays an important, perhaps pivotal, role in mountain building. "That was a surprise," Lowry said. "We think this indicates a feedback cycle, where the quartz starts the ball rolling." The geophysicist is continuing this work, extending his research area to the Midwest, which is in the process of being blanketed with EarthScope sensors. Headquartered at Oregon State University, the NSF project placed its first transportable array of sensors along the West Coast in 2004. Working across the country from west to east, it will complete its coverage of New England in 2013.